Discussion in 'Houseplants' started by SadSunday, Mar 16, 2019. Hi. I was quite happy with my houseplants, but recently I noticed a unseen mold creeping up. At first, I am almost certain, it killed my succulent's pot, now I noticed it on my hot pepper plant. Succulents were growing really well, until it started appearing and then almost all died (4 out of 5 different types that were planted on the same pot). I tried removing it with a toothpick, but that didn't save the succulents. Read up on powdery mildew control. Its easy to control, but hard to stop in the environment. Horicultural (food grade mineral) oil is used with baking soda in water or neem oil, or tea tree oil or thyme oil, or a host of other household substances. I have even slowed it with aspirin. If you can use something more like an oil, the adherance of the oil acts as a chemical barrier between the plant cells and the fungal spore. The fungus uses precise chemistry to attack the plant cells and the barrier denies that chemical or enzymatic access so theattack fails. Agricultural silicone is a long lasting coating to which fungicides might also be added. Thank you! Will definetely search for it. That is an insect actually. Squish it scrape it or spray it with soapy water. It is called scale. Something is hosting it that you have wintered over. Check all of you plants carefully and give them a good bath with a solution of soapy water. Cayuga Morning, SadSunday, Canadian Lori and 1 other person like this. Wow :/ It doesn't look like a big at all. Great to know, for me it reminds a candy floss. I removed it, previously - from succulents, but that didn't save it :/ Does soap matter when making a soapy water solution? A soap solution link is HERE. Neem oil is also a candidate. If you do not have one already, you are sort of working up a general spray program that works for your plants. Consider a broad protection including anti fungals for a easier one size fits all approach. If something truly nasty comes along, it will have a little harder time spreading because you already have something of a protective program in place. SadSunday, Kay and Canadian Lori like this. I use dish soap. Use Castile soap or anything you have available that you would put your hands in and use. Cayuga Morning, SadSunday and carolyn like this. nitram and SadSunday like this. Nitram is correct. It is mealy bugs not scale. Same solution though. Dish soap is the easier method of control although a hard stream of water can be enough to knock it off too. Soapy water did wonders! So sad I didn't asked here before, I had a nice pot of succulents that were destroyed by mealy bugs. It's gone from the pepper plant, I will still try to spray a bit more, but my pepper plant looks good. I used a few small leftovers from hand soap, led them dilute in the water for a night. Thank you so much! Dirtmechanic and nitram like this. 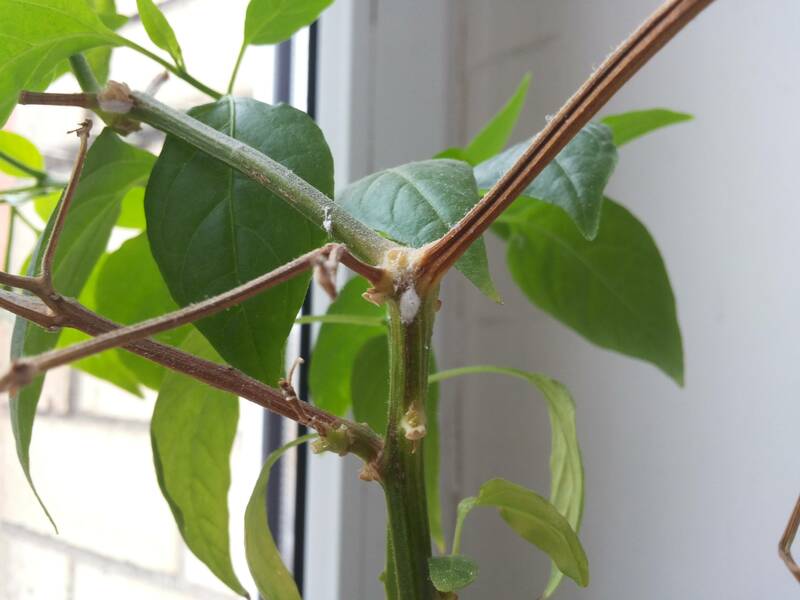 It is ironic that the very peppers from a pepper plant can be melded in a solution and sprayed back to prevent bugs. Tomato leaf too. The plants have defense, but need some help in distribution. Neem oil is a great mold cleanser. Moreover, it is innocuous. You can also use soap water solution. Make sure to clean off the surface after mold removal! My clivia plants had mealybugs. They were hard to get rid of because they would nestle in the crevasses where the leaf blade met the plant. In desperation, I began using a weak solution of rubbing alcohol on a Qtip, then giving the plants a shower in the tub to wash it off. I also resorted to a systemic. Plants & I have finally been mealybug free for a couple of years. I had to be diligent though. Cayaga.. I think that is just part of having clivia. I seem to find a few here and there on a regular basis. I had mealybug on a succulent and geraniums close to the clivia. I need to go check those succulents now that I am thinking about them. thanks for the reminder. I also spray them heavily with soapy water and then hose them off with a fine strong spray of clear water.